All international market leaders will exhibit at Techtextil, among them DiloGroup from Eberbach, Germany, with its units DiloSystems, DiloMachines, DiloTemafa and DiloSpinnbau. DiloGroup enjoyed above-average order influx in all important markets for its machines and installations and had record turnovers in 2015 and 2016. Due to an increase of about 20 %, the overall turnover in 2016 will reach a total of around 110 million Euros. This shows DiloGroup’s strong position in the international nonwovens machinery business. The increase has been accompanied by the creation of numerous new jobs. Now the complete DiloGroup has about 450 employees. In addition, we will increase our assembly space by 3000 m², the new hall is under construction and will be ready by mid-2017. As the leading group in the field of staple fibre nonwoven production lines DiloGroup will inform about complete lines presenting the latest developments in all components. The strong demand for DILO production lines is partly due to the high attraction of needled nonwovens themselves with a yearly increase in consumption of about 6 – 7 %. 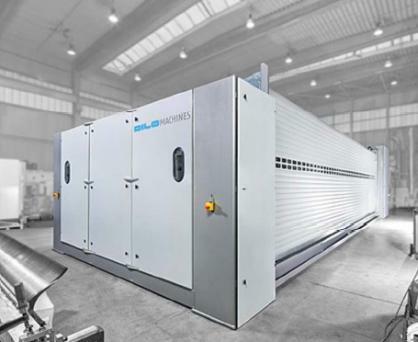 Staple fibre production lines start with fibre preparation – opening and blending – from DiloTemafa, card feeding and cards from DiloSpinnbau and end with crosslappers and needlelooms from DiloMachines. The quality of DiloGroup’s four equipment components, opening and blending, carding, crosslapping and needling, is important to customers. A DILO line stands for highest productivity with best web quality. This goes hand in hand with a high efficiency as the mentioned four machine groups are controlled by a single drive and control technique and fulfill all requirements for modern crosslinking and smart production. Customized lines are engineered, manufactured, delivered and put into operation by DiloGroup for the customer’s purpose and benefit. Service and spare parts supply to support the high availability of DILO nonwoven production lines is available worldwide. In addition to information about standard universal lines, we will inform about the latest developments in DILO machines which aim to increase efficiency and productivity by the degree of automation and improved end product quality. An example of such an innovation is the “Vector 200”, a new crosslapper by DiloMachines which is unique with an infeed speed of more than 200 m/min. DILO machines may be used for the production of nonwovens used in automotives, as floor coverings, synthetic leather, geotextiles and for filtration, just to name the most important fields of application. Considerable progress has been achieved in the processability of special fibres like carbon using recycled fibres to make composite materials. Compact special lines for product research and development with recycled carbon fibres are available and can be discussed with interested visitors. A close cooperation with needle manufacturer Groz-Beckert has advanced the development of the needle module technique and the intense needling of light weight nonwovens. Ample information will be available at the booth. Furthermore, DiloGroup will inform about universal needling technology and carding systems of wide working width and high web speed for water entanglement lines. For this important, special branch of nonwoven production normal lines have a working width of about 3.8 m and medium web speeds of around 200 m/min, DiloGroup’s portfolio includes carding systems of wider working width and higher web speeds. DiloTemafa offers in close cooperation with DiloSpinnbau these special carding systems with working widths exceeding 5 m and resultant web speeds of more than 400 m/min after water entanglement and drying. Reduced draft between card doffing system and winding are essential to achieve a high web uniformity and an acceptable strength ratio in machine direction to cross direction (MD:CD). DiloSpinnbau sets the standard for high productivity with the random roll technology and for best felt homogeneity by low draft. DiloGroup is very successful with these fibre preparation and carding systems in all nonwoven production lines with high productivity and quality requirements. Further important features of these special installations are the fibre preparation from DiloTemafa, the air technique for card suction, filtration and moistening which result in high line efficiency. At the Techtextil 2017 DiloGroup will explain the characteristics of DILO standard and special nonwoven production lines in discussions with international customers. Visit Dilo at Techtextil Frankfurt, hall 3, booth H31 from May 9 – 12, 2017.